I am sure many of you must hate scurrying to the beauty salon for that last minute waxing like me . With a busy work schedule and kids , taking time out for yourselves is a big luxury.Add to it the fact a that most parlors hardly ever open before 10 a.m. and after 8pm and you always need to book an appointment in advance too. 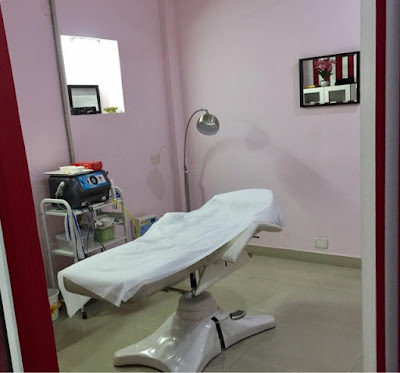 Of late I had been getting offers from some Beauty and Skin clinics to try out their laser hair removal , but I was sceptic .I was sceptic ,because from what I had heard - it is very painful and needs regular visits plus it is a long term commitment because a single sitting does not root out the hair .You need at least 6-7 regular sittings about 4 - 6 weeks apart to see a significant reduction in hair follicles .So I kept saying no to laser hair reduction . But a few months back , I had to appear for an event and needed to get a waxing appointment .I managed to be there on time but despite having an appointment, I had to wait for a good thirty minutes before I decided that enough was enough and I could not wait any further . It was then that I made up my mind to try the permanent hair reduction through laser treatment .At least once the treatment was over , I did not need to be at the mercy of beauty parlors and could enjoy smooth skin at all times . 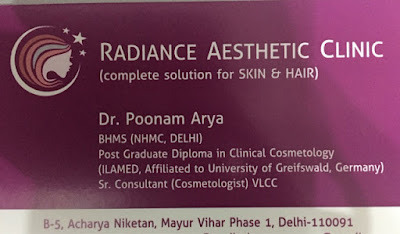 I said "Yes" and turned up to meet Dr. Poonam Arya , who holds a Postgraduate Diploma in Clinical Cosmetology from the University of Greifswald ,Germany and is also a Senior Cosmetic Consultant at V.L.C.C. 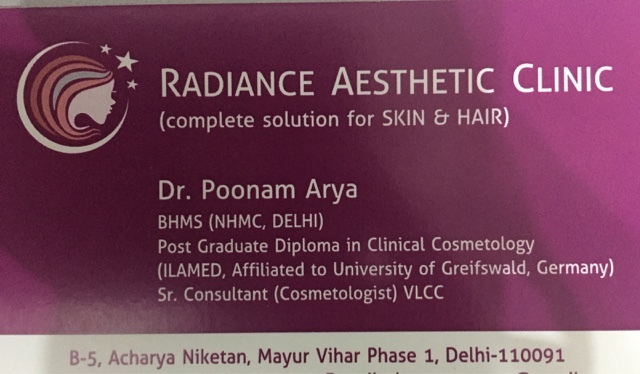 I met Dr. Poonam Arya at her Radiance Aesthetic Clinic in Mayur Vihar phase 1, Delhi . She took a short medical history and then examined my hair growth pattern .She told me that she was going to use the Diode Laser on me as this was best suited to Asian Skins .Then she explained the whole procedure to me and offered to do a free underarms hair removal for me as a patch test . Since I had made up my mind ,I agreed readily and we started on the same day . You should not wax at least 4 weeks before the appointment though shaving is fine .But shaving should also be avoided up to two days prior to your appointment . Avoid bleaching , it would sensitize the skin and your hair would not absorb the laser once it loses its pigment . Exfoliation of any sort should be avoided a few days prior to the treatment . 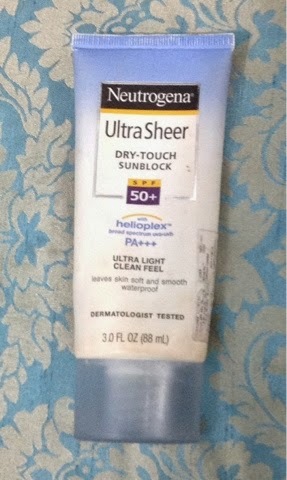 Use sunscreen and protect the skin from harsh sunlight. The Procedure - I was given a disposable gown to wear and the area to undergo laser treatment (in my case the underarms ) was shaved and then an anesthetic gel was applied to numb the area .I was provided with protective glasses to shield my eyes from the radiation .After a few minutes of applying the anesthetic gel, a lubricating gel was applied which was also quite cool and then the laser was applied . The doctor asked me if I was able to feel tiny sharp pricks on my skin while the hair absorbed the heat from the laser and adjusted the frequency of the radiation to the optimum level that would give results but would also be bearable . The whole process took less than five minutes and even though I felt the sharp pricks and the slightly hot tip of the laser gun (that's why the anesthetic and cool gel is applied ), it was much less painful than the sharp tugs of waxing ! Once the process was over , an anti-inflammatory cream and a sunscreen with SPF 50 was applied to the underarms .I was advised to use them regularly . No exfoliation , like scrubbing etc. to be done for at least one week. Sunscreen with SPF 50 to be used every 3 hours to avoid tanning of the area and to avoid pain and irritation .Even though I got my underarms done , yet I was asked to follow the same precautions . No bleaching to be done . Shaving can be done after one week . Hair will loosen up from the roots and start falling off after about two weeks but the initial result may be patchy as our hair passes through different cycles of growth and rest at different times . FINAL VERDICT - I did see 80 % of the hair fall out after 10 days of the procedure and even after one month only 10 -15 % growth was there but my fears were vanquished and now I am going to get all the sessions required to get smoother underarms permanently . I rate the whole experience a 4.5/5 . 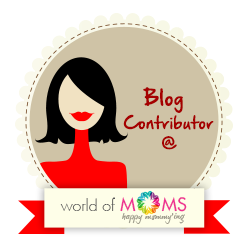 Feel free to post any queries here and I shall try to answer them to the best of my knowledge . Thanks for sharing this details. Great post. Thanks a lot ,Vidya ! 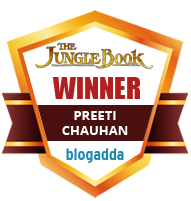 Thank You ,Shweta !To break some myths was really the goal . I am also planning for getting it done for under arms. 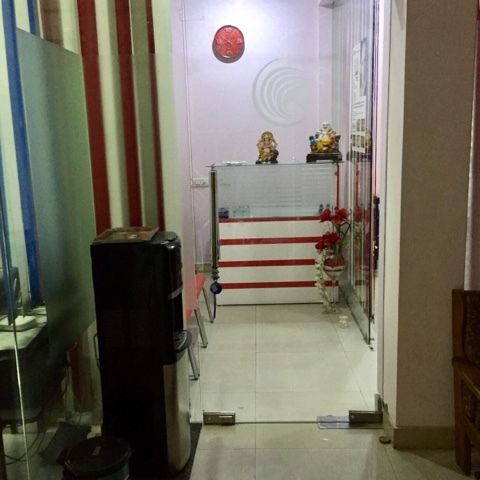 I have tried the trial session at Kaya skin clinic which is very good. 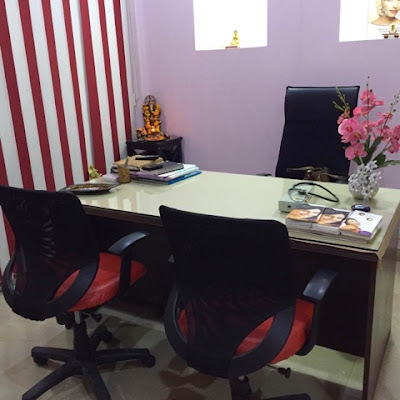 Deepika, kaya was my first choice too but here I got a lot more personalised attention to detail from a doctor rather than just technicians so this was a better experience ,plus there are far more hassles when you are dealing with a chain (read callcentre,delayed or cancelled appointments etc.). Everyday I miss my those childhood days! But Likely I have my two best friends with me always.